In an earlier post, I shared my exciting news about designing cards for Mitzi Sato-Wiuff. I absolutely love her interesting images! You can find her images at Scrapbook Stamp Society. This digital image is called La Mer. This is a 6X6 landscape single fold card. I colored the image with Copic markers. I purchase my Copic markers at Oozak. The background printed card stock is from The Storyteller's Club. The white satin ribbon is from Raisin Boat. The white pearl beads are from Michael's $1 bins. Seashells are from The Dollar Tree. I used a Heidi Swapp distresser around the mat and image and folded down a corner to add interest to the image. I added Stickles in Star Dust to add shimmer to the image and a silver gel pen for some definition. 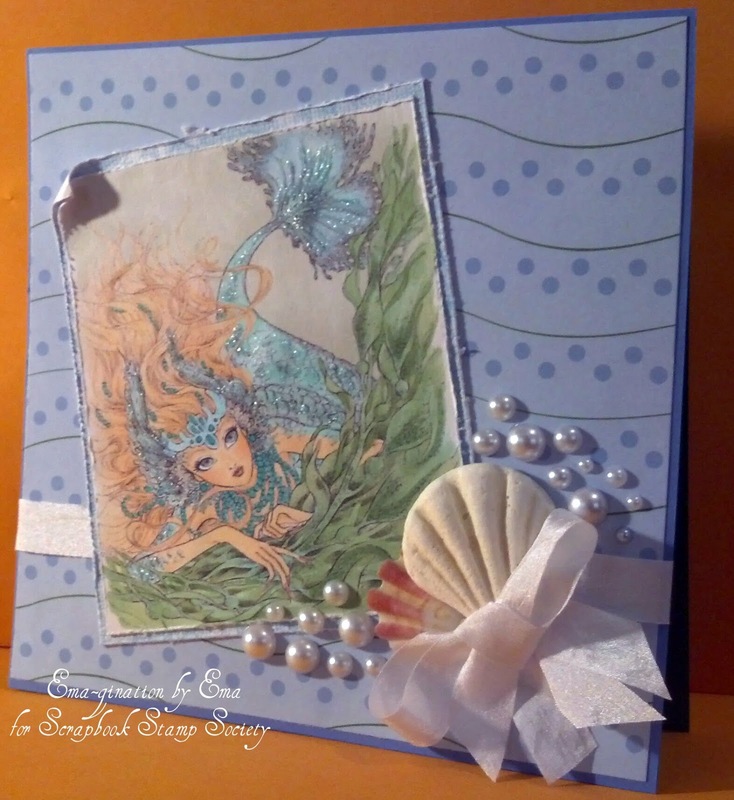 Be sure to join our weekly challenge at Scrapbook Stamp Society! This week it's Anything Goes and you can use any kind of stamp from any company; however, there is a freebie from Mitzi Sato-Wiuff available for your use on the challenge blog. There will be one random draw for a $30 gift card from Scrapbook Stamp Society and the DT will pick their Top 3.
it's a gorgeous card Ema. I have become a follower too. Love that way it all flows together.